Paths can be made out of all kinds of materials but one of my favorites is natural stone either as steppers or flagstone. Stone can be laid in a stone dust base and arranged and re-arranged to get the look you want. 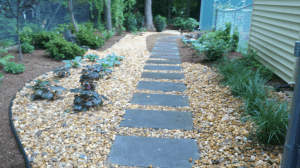 A recently completed project has 2' x 3' flagstone pathway through a river rock sweep. This was a damp and muddy lost space in the client's yard. Grass refused to grow and the moist soil meant that every time the lawnmower drove through it more ruts and bareness followed. 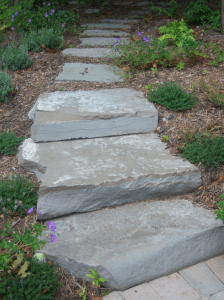 Combining broken irregular flagstone with large garden steppers as stairs keep an informal yet functional feel. This project was done to transition between a lower paver brick patio and an upper wooded area. The walk terminates in a rustic flagstone patio used as a sitting area.